It's hard to believe this series is nearly twenty years old. The CGI looks on par with anime from the decade that followed it. Now before I start heaping praise upon this series I will point out my bias here. I'm pretty much a sucker for anything with space battles or sword fights, and this series has both. Looking back, this series helped create my bitterness about anime cliches. Because this series has none of them. It's not set in high school nor does it star high schoolers. It doesn't center on unrequited love. Not once did I call for Bright Noah. None of the characters are simply eye candy. And I don't have to endure some boy with a girl's name hollaring about justice, friendship or how they're gonna single handily rid humanity of it's enemy. It's just a simple fun space adventure. The key is it never alters it's tone. It's an action comedy (they were all the rage in the 90's) and it never forgets that. Every episode gives you the action and comedy. It's not perfect, though few things are. For starters very little is explained in this series, that's a mild problem for a sci-fi series. I had questions, and I'd like answers. I got a few, but not all. While the CGI looks good, the animation shows it's age. This might turn off viewers who don't have a sense of nostalgia for 90's anime. There's one other flaw I want to mention and that's the use of Noo as the principal villain. If you don't know who Noo is, watch Captain Herlock: The Endless Odyessy. I'm not going to spoil it here but needless to say Hal Jordan is over qualified to solve the problem. Watch it if you're out of new series to watch. You won't be blown away, but you will be entertained. Might not be the best show ever, but it sure is fun! 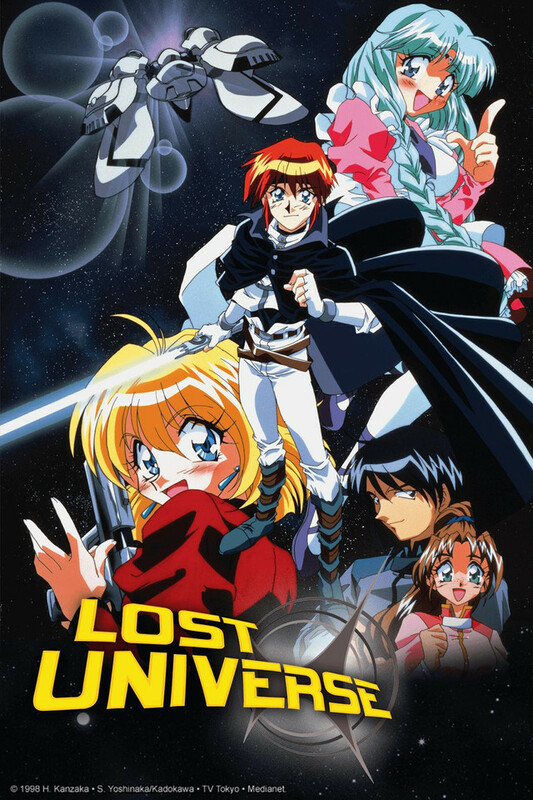 I remember this from growing up, basically slayers meets outlaw star. I always loved how imaginative the show was and how memorable the characters were. It starts off as silly and lighthearted, and keeps that tone quite a bit, but at the same time builds up a great story line full of suspense and twists and turns that unfold into one heck of a final battle. Animation style reminded me of the Slayers series somewhere in the 90's. I really enjoyed this series lots of action some decent comedy good characters and very likable the bad guys were sometimes very bad as they should be of course our hero wins in the end which brings me to my only real disappointment with it I didn't like the way it ended but sure didn't ruin the overall experience. It doesn't have hardly any fan service if that's a concern could watch this with your kids if you wanted to the dub was pretty good. I'd recommend it. So maybe if you are a fan of older anime and can't get enough, especially of a dub, you might add this to your collection. Personally, I found it unwatchable. The work might be considered very stereotypical of this era of anime, being shallow and poorly dubbed. It does feature some early 3D, which is passable. Not a huge fan of this type of Anime I prefer the more realistic type. They really limited the movement of the show to probably save a buck in production so that is a draw back. They story is good though and English dub is a plus. It is worth watching I do not think you will be disappointed with how the show story moves. I watched the first ep. So, the dialogue really shines in this show. It's funny and it's not melodramatic like all the other animes in existence. The characters feel like real people even when they are being silly. The action is pretty good. oh, and the main character has a lightsaber. So, can't go wrong there. If the rest of the series is as entertaining as the first ep, this won't be half bad.